Welcome to Project Districts - a Creators Dream | 3DCoinTalk! I want you to Imagine what it would be like if the Internet was expressed through a Virtual-Reality World with User-controlled Avatars interacting with one-another. In this world your experience of the internet is fully immersive and in motion - Visit what you view, and experience what you observe. Will you Create or Indulge? - the potential is bounded only by your Imagination and Freewill. Choose wisely, as this too has Real-World consequence. Welcome to Project Districts - a Creators Dream. -Images and videos is intellectual property of Blockchain LLC and Project Districts. Disclaimer/Disclosure: I am currently Invested in this project, I am not a licensed financial adviser, this is not to be considered as investment advice - do your own research. So what is Project Districts? Simply put, it is a synergistic manipulation of Blockchain and VR technology to facilitate Human interaction and experiences with real world consequences. It is a decentralised network that collectively hosts a 3D Virtual World whereby the medium of exchanging financial value is conducted with the Crypto-currency '3DC'. Consider the use-cases of the internet itself, start with that list, then add to it - this is what Project Districts has to offer. Before getting into the specifics of it's utility crypto 3DC, lets explore some particular use cases that will be greatly enhanced via this platform. Education - In today's world, students have access to an abundance of resources online, however the learning process is mostly self-reliant without real-time 'face-to-face' mentoring. Let's say you wanted to learn Kung-fu (Yes, a Matrix Movie reference), but you want to learn from 'the best' and they live remotely overseas. Well in Districts they could erect a Grand and beautiful Dojo or Temple without the cost of brick and mortar, and open it's doors to the world at-large. When I was attending University myself back in 2008, there was a common problem that was encountered frequently - classroom sizes and overcrowding. Try juggling a laptop, textbooks, handouts and pens while leaning against a wall. By transitioning to a Virtual environment, we can provide education to a greater demand with significantly less resources. Entertainment Why do we really go to the Movie Cinemas? Ok sure maybe it's a social thing for some - and you're probably the types that ask a-lot of questions during the movie, but I'd argue it's for the 'Big-Screen' experience. Well how about a 360 degree enclosed screen where you got front-row seats within the film? This is not only the future of the Film Industry, but Television Programs and Music videos as-well. One such crypto company comes to mind - Vibe (you can google it later). Now what about activities such as Tourist Travels? You could traverse Mt Everest and the depths of the Grand Canyon in the same day - Granted it may be an 'experience discount' from the real thing, but it's leaps and bounds over the youtube screen. Another such crypto project is also working on this particular service known as Ubitarplay, and it is creating a tourism jobs industry on top of VR-technology and Blockchain. Commerce What does Amazon, Alibaba, and Ebay all have in common? Well besides being Giants in the industry, they're all online. What do you do when you make a decision on purchasing a product online? You look at the pictures and read the description. 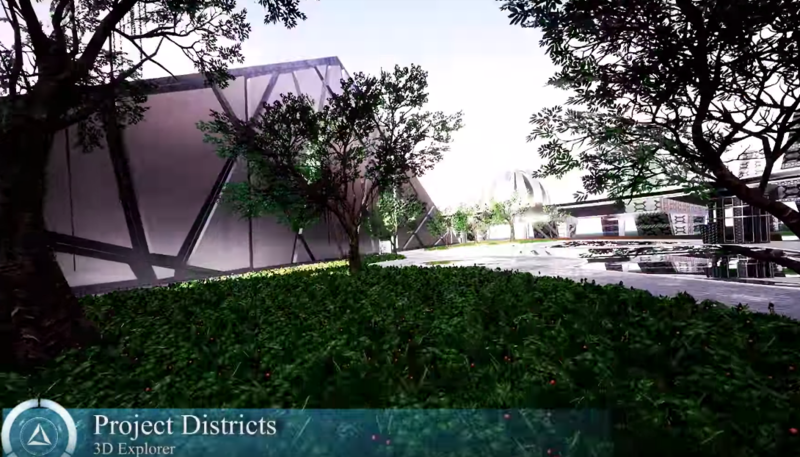 In Districts, users will be greeted by luxurious stores (the kind that spare no expense because there is no expense), you will navigate around inside the Virtual Store, and browse a complete selection of products. Holographic technology can synchronise your shape to your avatar to try on Virtual clothing, then purchase with 3DC over a secure encrypted network and the product is delivered to you in real life. Alternatively, 3DC Interoperability with multiple Blockchains will allow for users to utilise other Crypto-currencies and their features. Moving beyond products and stores, freelance services can showcase their works in 'display-rooms' such as designers, craftsmen, and animators. Social Networking After the word got around about the Cambridge Analytica scandal with Facebook, there's been a growing desire for decentralise Social-Media platforms. Coupled in the wake of this is an increasing push towards individual ownership of private data with the likes of 'GDPR'. Districts solves both these issues while maintaining (if not improving upon) the social elements of interaction. As an Avatar exploring the Virtual world you are not wearing your personal information or communication history as it were clothing - what we see most of one another currently via social media is profiling data in a larger sense. In Districts such information is absent, what remains is the interaction. There are countless examples and use cases that can utilise a singular VR-world, and the way in which Project Districts does so is by providing a 'sandbox' for multiple ecospheres. This leverages value and incentive to participate within Districts - traffic, participation and interaction from one business enables a roll-on effect to other 'neighbouring' businesses in the same way it does at large shopping malls. This key feature that online adds fail to replicate will function naturally within Districts - when one business deploys a virtual store, it will increase the growth of what is deployed beside it. You might be thinking that not every small business has the skills, expertise or capital to launch their own 3D decentralised app (3D Dapps), the process for app development is usually costly and lengthy. However, this process itself has been simplified with the integration of Project Districts very own SDK that requires no experience or cost. The SDK is user-friendly, it allows anyone to click-drag items and features with ease while the software automates the development code. If you ever played the computer game "Sim-City", consider yourself qualified to deploy your own custom 3D Dapp. The developers have designed Project Districts to be easily used to create what you desire with nothing but an imaginative idea. Project Districs is a 'Painters canvas', and the SDK provides the paint and brushes - it's child's play, but capable of creating an intricate Masterpiece. 3DCoin is an Advanced 4th-Generation crypto-currency and hybrid Fork of Dash. It utilises programmable 'Smart Contracts' that function with Industry-used developer languages. It is a PoS/PoW algo allowing both CPU/GPU mining while staking for Masternodes payouts. The nodes can perform Instant transactions, host 3D-Dapps, facilitate 'Land Parcel' payments and commissioned rewards, and host multiple Blockchains for Interoperability uses. The network can scale with the use of 'Data Capsules', and includes optional transaction fees, coin blending and coin mixing for user-choice privacy. It's Maximum supply is fixed at 85,000,000 total, and currently there is roughly 65,000,000 in circulation. Since the mainnet launch a little over 2-months ago, the community has contributed to rapidly growing the network to over 1,600 Masternodes. To put that into perspective - the popular PivX has around 1,900 and Dash around 4,600 after 4 years maturity. Pre-sale price was pegged to Bitcoin, so that fluctuations in Bitcoins USD price would not effect the quantity you'd receive - 1 Bitcoin was pegged to 40,000 3DC. As of writing 3DC is awaiting an exchange listing, but expected for end of Q2 to early Q3. Via the Districts.io website you can view the Whitepaper to get a better understanding of what Project Districts and 3Dcoin is, and how they function together. Alternatively, you can view the brief Video below. How can I acquire 3DC? Open the 'QT-Wallet' and let it Synchronise to the network. They are also currently running a competition till the 10th of July for your chance to win a 'High-End Work Station'.